This is a project I do around Christmas time, obviously. I like that I get to teach the kids how to cut better, glue control (oh that's a biggie), and assembling a project together (collaging, per-say). These are a beautiful addition to the hallway. I also change it up with what we 'add' for detail. 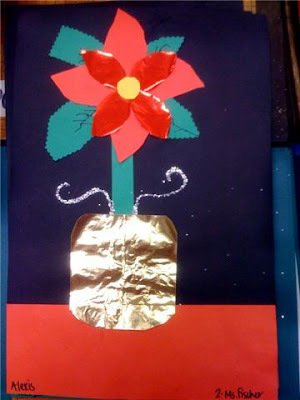 For instance, this time, I had metallic paper so I used that for the vase and for the little petals. Last year I used feathers and added them for fun. I didn't have feathers this year, so I decided to add glitter. Whatever you add, they turn out really fun and they are a great project for any parent to take out every year at Christmas-time and decorate the house with.